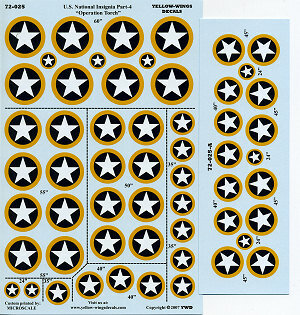 Moving right along with new insignia sheet releases, this one covers the yellow surround insignia used during Operation Torch in November of 1942. Directives state that this insignia was only required on the fuselage and wing underside (both wings). However, photos do show that some put them on the upper wings as well so have your references handy. These decals are in 24, 35, 40, 50, 55, and 60 inches. There are at least eight of each. One full and one partial sheet are included to provide sufficient decals. My sample has some slight registration problems with the 24 inch markings on the main sheet (or I need new glasses). However, since these markings were generally hand painted and some were quite irregular, it shouldn't be a problem. Insignia sheets are a huge help when the kit decals fail or if you need some unusual sizes for a project. They always sell well and this one should be no exception. Thanks to Yellow Wings for the review samples.